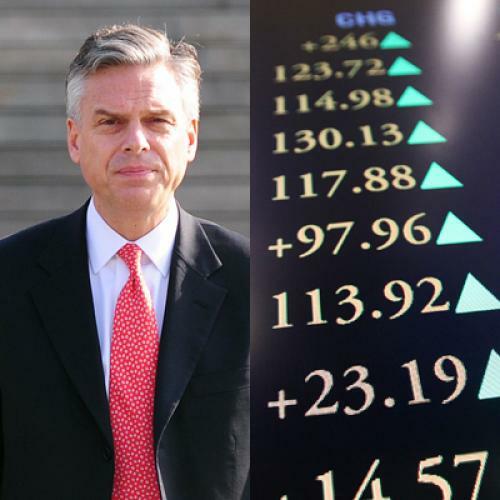 Few people expect Jon Huntsman to win the Republican nomination. Indeed, it seems obvious to many that his odds are a lot worse than 1 in 10. But on the predictions market InTrade, a stock-inspired betting website that has become the go-to source for GOP guesswork, Huntsman is currently valued at an impressive 11 percent chance of victory. So could the online market know something about the GOP field that the rest of us don’t? Conversations with several economists indicate that the answer appears to be a resounding no. While InTrade’s cold hard data can seem soothing to many a frazzled political journalist, there’s just one problem: In this context, so early in a nomination race, the numbers it produces are virtually useless. But in the context of the GOP nomination, InTrade simply isn’t up the task. The first and biggest problem with the predictions market is its tiny trading volume. As of this piece, the site reports that only 74 contracts were traded on Monday on the nomination of frontrunner Mitt Romney. Moreover, the bets wager no more than $4 apiece. In other words, in a barely-begun race between many candidates, there simply isn’t the volume or risk necessary for InTrade’s market to work its supposed magic. As Yale economist and electoral predictor Ray Fair explained to me, this is the site’s Achilles heel. In general, Fair says, low volume is a problem for all the bets placed on the website, but “for small contracts like [the GOP nomination], it’s even worse.” Mark Perry, a University of Michigan-Flint financial economist and American Enterprise Institute scholar, agreed, arguing that “with a thin market like that, you have less information transmitted through the odds.” And financial journalist Felix Salmon made the same argument to explain why he quit the site. The second problem with InTrade is that, in a GOP primary race, the market’s greatest strength—aggregating polling data to reflect public opinion—is lost. InTraders don’t predict the future; rather, as economics researcher and writer Barry Ritholtz argues, they respond well to data in the immediate past. At the last-minute, before a big election, prediction prices do a good job of centering on public opinion, and eventually, on exit polling. But primaries, especially this early in the race, have too little polling information to aggregate. And unlike in the real stock market, there are few experts or insiders to provide information about a contract’s fundamental value. That’s why InTrade blew the 2004 Iowa primary, the 2008 New Hampshire primary, and whether or not Republicans would hold onto the Senate in 2006. Finally, the third problem with InTrade’s ability to accurately assess the chances of GOP contenders is that it artificially inflates the odds for long-shot candidates. As the influential economist Tyler Cowen argues, it does this by discouraging short selling. For instance, suppose you want to bet against Jon Huntsman, whose aforementioned odds currently stand at an implausibly high 11 percent, or $1.08 per contract. If you want to short his contract, you need to put in a long-term sell order—and InTrade requires you to put up collateral equal to your maximum possible loss (in this case, $8.92). On Wall Street, you can keep a deposit like this in interest-bearing treasury bills or a bank account. But on InTrade your $8.92 is stuck, without accruing any interest. In other words, InTrade provides little incentive to trap your assets in a risky, long-term, interest-less short. But without serious short sellers to deflate the price, many of the candidates’ odds become inflated. As Fair explained to me, “Many of these contracts should really be at zero. The smart money would go in and drive them down, but it can’t because there’s nobody willing to take the other side.” As a result, Huntsman stays at 11 percent, Perry at 18, Palin at 5, the media lazily reprints the odds, and the GOP field appears far more open than it really is. InTrade sells itself to journalists as a big idea: the power and precision of the invisible hand unleashed to read political tarot cards. But when it comes to the GOP nomination, InTrade isn’t a master market at all. It’s just a small potatoes betting ring—and it’s not newsworthy.